The Climbing Works first opened in Dec 2006 to a climbing public unused to bouldering exclusive centres. A 10,000 sq ft dedicated space; it was completely unique in the U.K. There were many doubts over whether it would succeed and if it was just ‘too’ big. Fast forward 6 and a bit years and The Climbing Works is now considered too small by the vast amount of people who enjoy the centre. Since we opened we have introduced thousands of people to the sport of bouldering who have enjoyed the unique atmosphere that we work extremely hard to maintain. For the last few years the question of ‘when will you expand?’ has grown from a rare event to a constant affair. The difficulty for us was always ‘go where?’ We couldn’t go up or next door as the buildings just did not suit. Finding somewhere that would maintain the atmosphere and further enhance it was proving a very difficult task. Well, we believe we’ve finally found somewhere and luckily for you all it’s not too far away. In fact it’s about 50m away. Some of the regulars may well have seen the work going on or seen us going back and forth to our new unit but for those unfamiliar we will be expanding into the old Eurosafe building which is in the opposite corner of the same business park (Centenary Works). 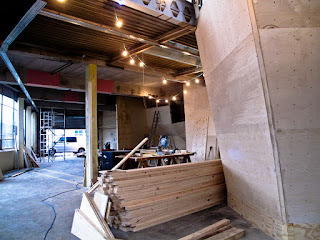 We started work on the new build about mid-January and it’s been a steady process to where we are today. All the main climbing walls have been finished and we’re just about to start work on the reception. We’ll be releasing more information as we move closer to the opening date but below is a quick summary of this new ‘Mini-Works’. We don’t have a definite opening date as of yet but at the moment we believe it should be ready for the middle to end of April. The photos you see are a of a week ago. We've built a lot more since then. So what is being built in this new unit and who is it aimed at? Well it’s a big ‘un! Percy, Rob & Matt have out done themselves and created some beautiful walls. 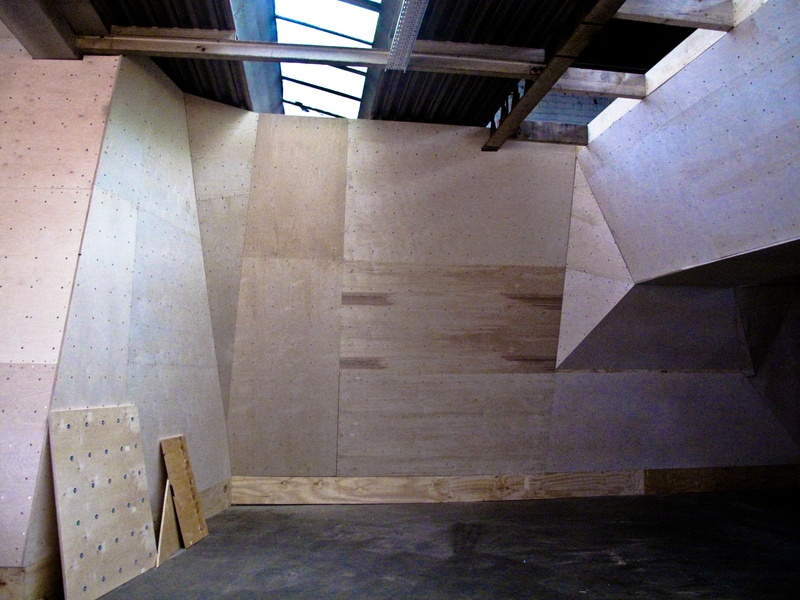 The unit space is just under ½ the size of our current place and it will have more vertical, slabs and easier angles for those looking to learn and develop as a climber. With this expansion we have looked at the increasing popularity of bouldering to kids, groups and adults (new to climbing) and built a facility that will excite and challenge them. The increased space will also create a more comfortable and safer environment for children to enjoy their climbing education. There will also be plenty for younger kids to go at and we will also be expanding and developing our very popular kids clubs to meet the demand from parents. It also allows us to do more with groups so if you are involved with Scouts, Schools or even a local Business looking to do something fun with your staff, this would be the centre for you. Overall there will be something for just about everyone but in general the main focus will be on those climbing in the Font 6b and below grades. If that means nothing to you (or your kids) we’ll be introducing some other ideas so you can figure out which colour will suit who in your family. The big change for this facility will be the quicker induction process for parents wanting to take their kids climbing for the first time. This new unit will have a shorter (about 15mins) induction process that will focus on parent’s supervision of their children allowing their kids to get climbing sooner. We’re hoping that this will allow our current members to spread the word of bouldering to their friends and family. If you already bring your kids to The Climbing Works then this new Mini-Works will provide a great place for you to climb with your children while still testing yourself. As a Climbing Works member can I climb in it? Yes. The Mini-Works is still part of The Climbing Works. You can climb in the new unit and cross over to the old place or vice versa. There will be no extra cost to enter either building. There will be a reception and café area in the new Mini-Works and once you have paid in at one reception you can climb at either unit. If you want a bit of extra space on a busy Works night, want to try some different problems or just fancy a change of angle, you’ll be able to pop across to the Mini-Works. We’ll have slightly different opening hours for the new unit but we’ll let you know all the details in the coming weeks. Over the last few years we have seen the number of children wanting to climb explode with all our kids clubs pretty much packed out with long waiting lists. This new centre will allow us to create a whole range of new sessions at different times of the day to cater for different ages & abilities. We’ll be advertising these sessions in the coming weeks so keep an eye on the blog and website for more details. So there you are. More walls, more problems, more space. All for the same entry price. We look forward to seeing you enjoy this great new centre. For more details keep an eye on this blog over the next few weeks.